This spring, 40 Canadian youth aged 18-30 came together in Haida Gwaii for a 10-day expedition as part of Ocean Wise’s Ocean Bridge program. Ocean Bridge aims to empower young people to make an impact in ocean conservation by giving them the tools and confidence to lead educational and service projects in their own communities. Canadian Geographic is featuring the voices of some of this year’s cohort as they reflect on their experiences in Haida Gwaii. Just a few short weeks after returning home from my expedition to Haida Gwaii with Ocean Bridge, I found myself reminiscing on that time when technology was limited, and friends and learning opportunities were plentiful. Interacting with so many diverse individuals who reflect the multicultural nature of the Canadian identity has inspired me to pursue new dreams that revolve around environmental preservation and appreciation. The weather as we explored the Pacific Northwest was often cold and wet; however, our hearts and minds were warmed with a newfound understanding of ocean issues and the implications they have for the Haida people. One of my favourite events was the Youth Day hosted by the Ocean Bridge Community Engagement Team. Locals came to visit us at Hiellen Longhouses for a lunch BBQ with fresh venison burgers. I had an amazing time chatting with some of the young girls and getting to know them over the course of the day as we took nature walks, dug for clams, and created an interactive art project on ocean awareness. 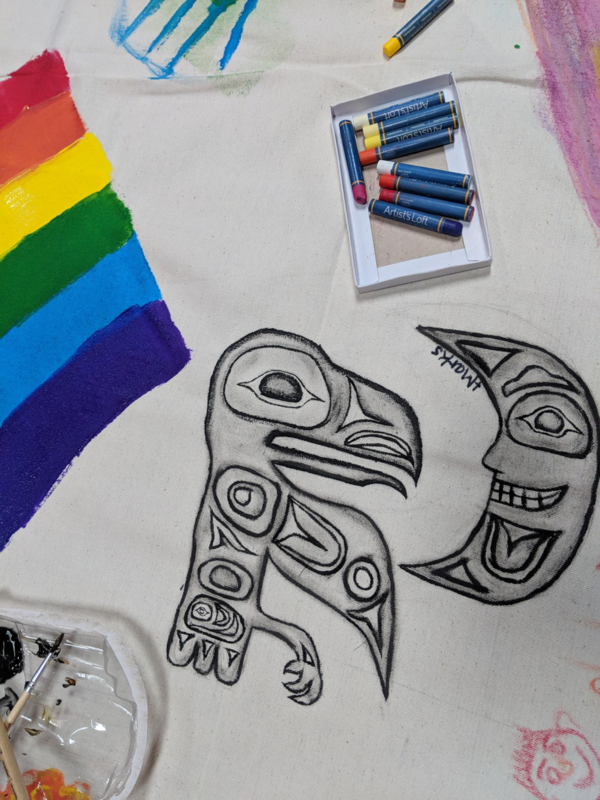 One of the girls was a beautiful Haida artist and hearing her speak so passionately about her art was the highlight of my day. Youth engagement is a huge part of what we do with Ocean Bridge and it was so rewarding seeing how much fun they were all having at an event that we worked hard to plan and prepare for. Each and every day in Haida Gwaii brought on new challenges, perspectives, and educational opportunities. This adventure introduced us to the Haida culture as we learned about their history, hardships, and resilience. The interconnectedness of the Haida and the environment is an amazing relationship and hearing oral histories firsthand from locals and cohort members was something I will truly cherish forever. Staying at Hiellen Longhouses and waking up every morning surrounded by towering trees and open ocean was positively magical. As our group travelled across the beautiful archipelago, we learned about ocean health -- and our own potential. We completed two beach cleanups, removing more than 1,000 kilograms of debris from the shorelines. Some of the participants attended a language lesson with Haida elders while others engaged in citizen science work by doing intertidal surveys and invasive plant species removal with BC Parks. Haida Gwaii was the perfect setting for service learning. Not only have I learned a lot more about leadership, planning, and facilitation by being a team lead for the Ocean Education Team, I learned much from my fellow cohort members. Many of my new friends from Ocean Bridge are educated scholars, world travellers, fluently multilingual, photographers, writers, poets, artists and scientists. Together we explored not just ocean issues, but gender equality, human rights, cultural values, languages, education, and so much more. Most importantly, we are all environmentalists who love and care for our planet. Hannah on the beach during a cleanup. I feel a great sense of pride in being a part of this pilot program, and Ocean Bridge continues to influence my life in so many ways. I have started implementing the Ocean Wise #BePlasticWise campaign into my everyday life. Before joining Ocean Bridge, I was completely unaware of the extent of the problem of single-use plastic consumerism and the danger it poses to aquatic ecosystems. Just a few months ago was I still using plastic bags at the grocery store and taking straws at restaurants. Today, I am carrying my own takeout containers with me, using a menstrual cup, and even shaving with a safety razor instead of using disposable plastic razors. Social media has been an amazing place for me to share my Plastic Wise and Ocean Bridge journey and it is an amazing tool for raising awareness on different ocean health issues. The Ocean Bridge Ocean Education Team is now compiling information from our trip to create new programming that can be used by Ocean Bridge as an educational resource and we are excited to continue our work throughout the year. As a member of Girl Guides of Canada, I am also dedicating many of our unit meetings to teaching girls about the environment and issues revolving around marine life, shoreline protection, and water conservation. Through the Ocean Bridge Program, I am currently developing a partnership between the two organizations to create an Aquatic Ambassadors challenge for girls. This challenge will be adaptable for girls of all ages and will teach them about ocean health issues from multidisciplinary perspectives. After the challenge is completed, they will receive a badge as a reward for their actions and contributions to ocean health service. The Aquatic Ambassadors challenge will highlight the importance of Indigenous knowledge and will also require Guiders to plan a workshop meeting with a female professional who works in an environmental field. I am so excited to continue working on this project under the support and guidance of Ocean Bridge mentors. The Ocean Bridge program is an amazing opportunity for youth and I am so privileged to have been chosen as one of the 2018 ambassadors. 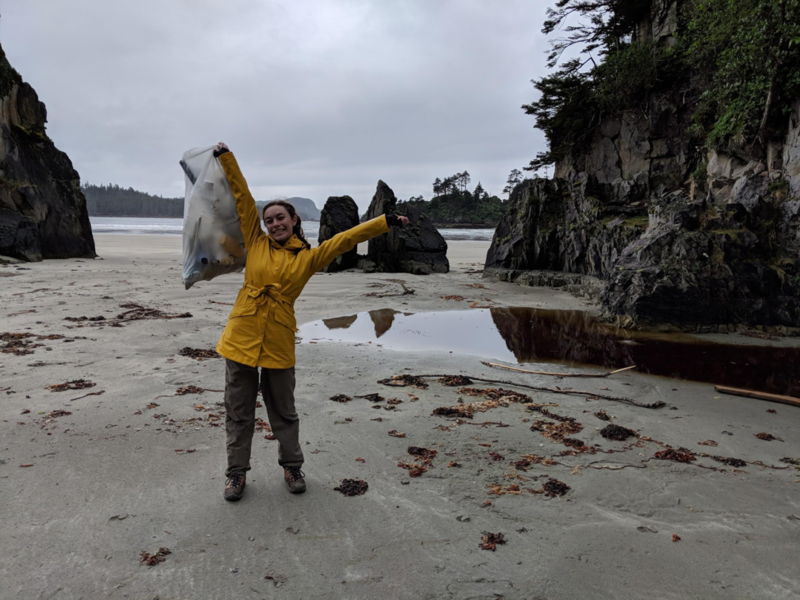 Travelling to Haida Gwaii introduced me to the power of service learning and helped me create meaningful relationships with locals and participants from across the country. Having these new connections will continue to open doors for all of us as we continue our post-secondary education, professional work, and ocean service in the growing world of environmental advocacy. A self-described educational enthusiast, culture and history junkie, and camping connoisseur, Hannah Kosick hails from Port Morien, Nova Scotia. She is currently in her second year of the environment honours program at Cape Breton University. She also works for Parks Canada during the summer.